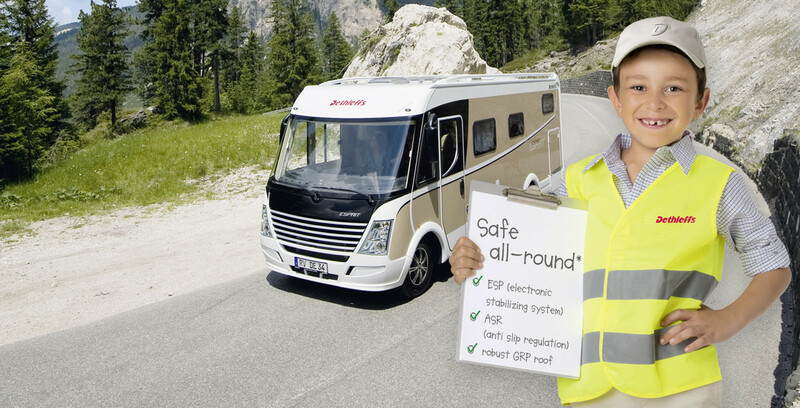 With a Dethleffs motorhome you are always safe and protected allround! Today the ESP is an unimaginable safety equipment in the passenger car sector. The most of the Dethleffs motorhomes* come now as standard with ESP which can save lives under certain circumstances. ESP (electronic stabilizing system) – controls the driving direction of the vehicle and the movements of the wheels. If required, especially in dangerous situations it will be activated, brakes the single wheels or slows down the speed of the vehicle by performance reduction. Consequently, it safely keeps the vehicle on track. That is also a part of the Dethleffs all-round safety: vehicle roofs are made of the robust GRP and offer an improved protection in comparison to the conventional Aluminium roofs e.g. from hail damage. Esprit Comfort T/I 7150-2 and A 7870-2.